Once upon a time, long ago and far away, in a beautiful river valley there lived a group of knights that really liked wine. Initially the area was populated by dairy farmers, who liked the fact that they had ready access to water, and that the river contained lucky pebbles that they’d collect and place in their houses to keep the evil spirits away. But as time went on some of the farmers became rich enough to qualify for nobility, and discovered that wine is much more fun to drink than milk. So these rich farmers converted from dairy cattle to wine growing, and their profits grew. 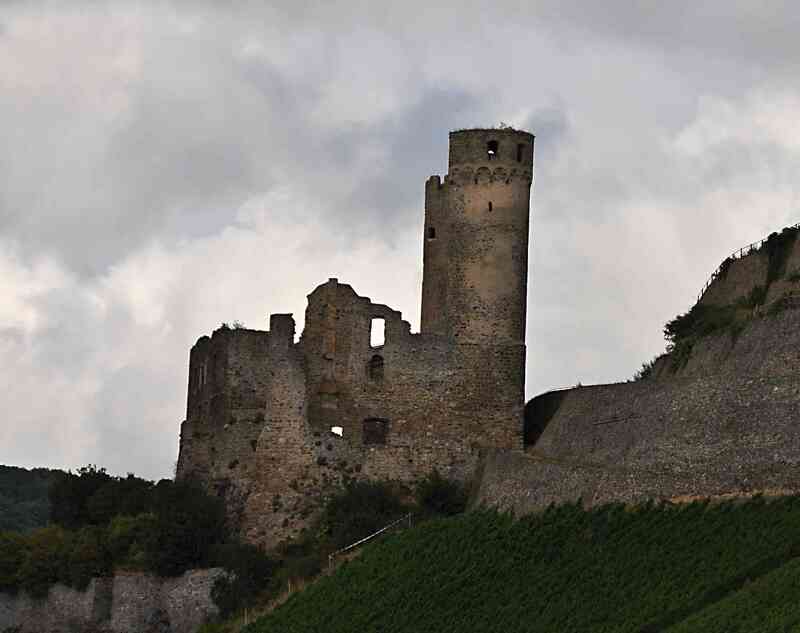 Eventually, to express their affluence, they replaced their modest farm houses with the lucky pebbles with big fancy castles with large rock walls, with lots of storerooms to keep their wine and money safe. The wine quality was good, and they made so much it spilled into the river. To celebrate, they decided to have a big party and give the river a new name. After much drinking, carousing, and slurring of speech, and because there was so much wine spilled into the water they decided to call the river the Rhine. 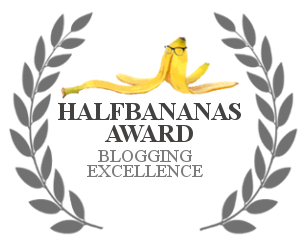 And they all lived happily ever after, except for the headaches associated with maintaining cold, drafty old castles and the hangovers from drinking too much wine. Ok, so there’s not a shred of truth in that story. 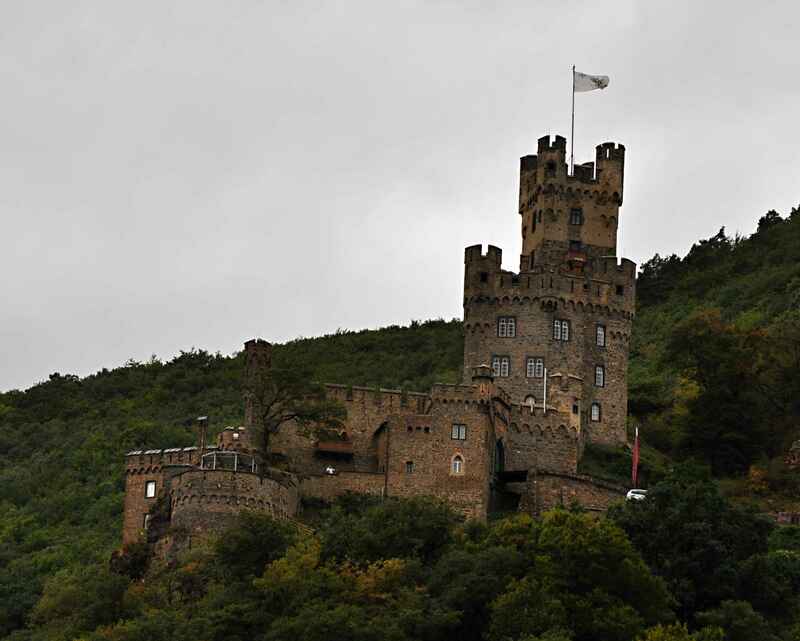 But as we did a river cruise down the central part of the Rhine river, I couldn’t fail to notice how many castles and vineyards there were in the valley, and I couldn’t help but come up with some sort of narrative that might fit. The reality, it appears, is less of a fairy tale. 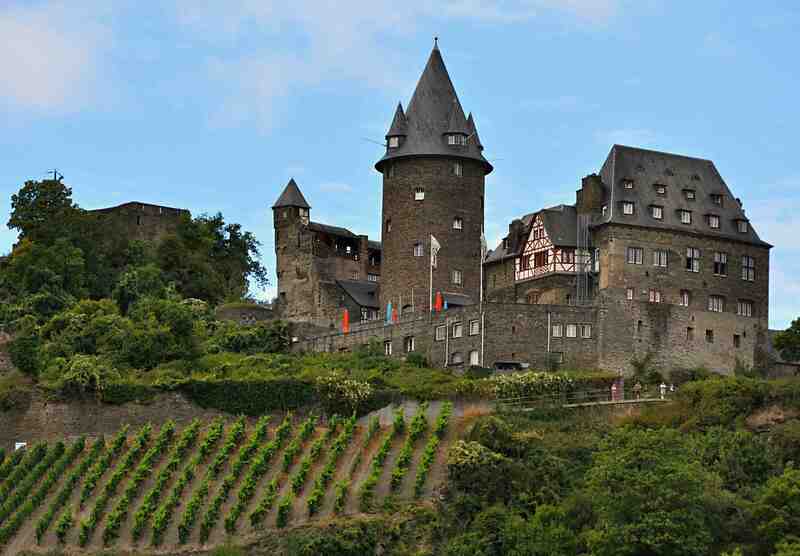 Light research suggests that most of the castles were built in the 11th-14th centuries. They served two main purposes: as defensive fortifications, and as a basis for imposing tolls on those who used the river for transportation. Although most have survived into the 21st century it’s only because they’ve been rebuilt after battles or simple neglect, sometimes more than once. Many of them were destroyed in 1689, when the French came through the area on a rampage of destruction that makes Sherman’s Civil War march on Atlanta look like a spate of vandalism. 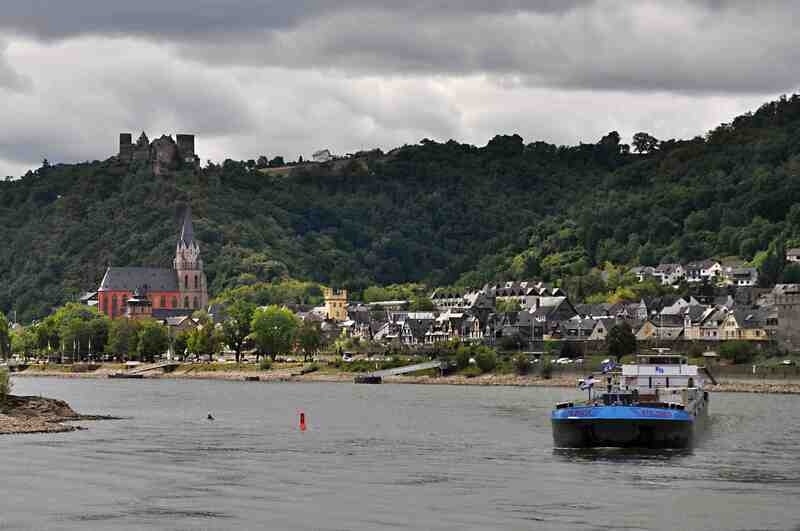 Transportation is still a major player on the Rhine, it’s the busiest waterway in Europe. The barge traffic was one of the first things we noticed when we first saw the Rhine in Mainz, and we saw more of it on our cruise. Those fabled wine drinking knights (or was it fabled nights of drinking wine) picked a pretty nice spot for their merrymaking. 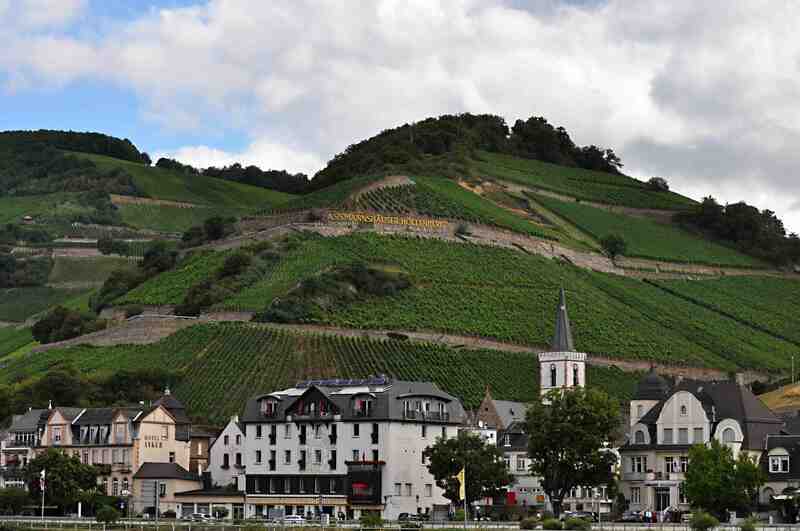 The Upper Middle Rhine Valley between Koblenz and Bingen was granted UNESCO World Heritage status in 2002 for its outstanding, vineyard-sculpted countryside. 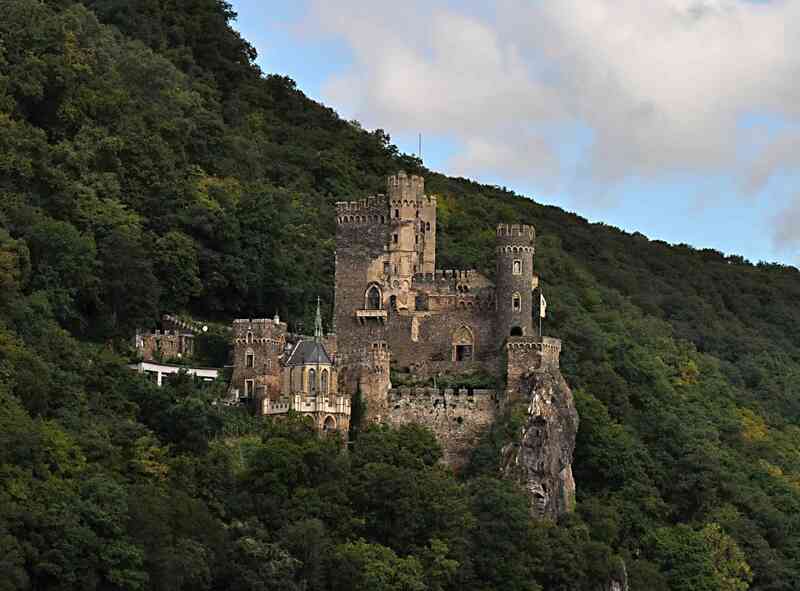 Leading up to our river cruise, and on the river cruise itself there were constant remarks about Lorelei Rock, and the legend of the Lorelei siren. According to German legend, there was once a beautiful young maiden named Lorelei, who threw herself headlong into the river in despair over a faithless lover. Upon her death she was transformed into a siren and could from that time on be heard singing on a rock along the Rhine River, near St. Goar. Her hypnotic music lured sailors to their death. 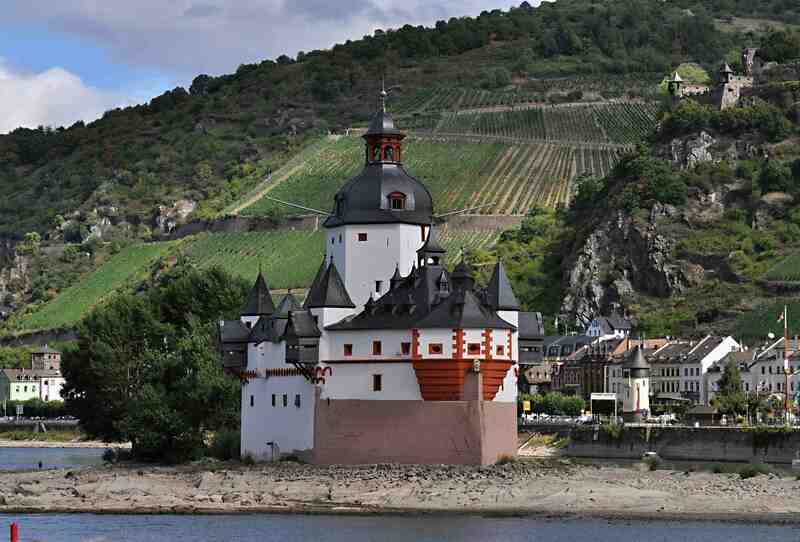 The reality is that Lorelei Rock sits at a bend where the Rhine comes to its narrowest point. Between the acoustics of the area causing sound to echo off of the rock, and the current accelerating through the narrows this section of the river could make for scary navigation, especially for those old time sailors that didn’t have the benefit of modern navigation tools and big engines. The rock itself was anticlimactic, I was expecting something much bigger. Or maybe it’s just because those knights of old gave up on cow herding and stopped using their lucky pebbles. All that grief and destruction might have been avoided if they just hadn’t stopped being Rhine stone cowboys. Is Mainz German For Maze?